Did you know that there is a little salt oasis tucked away in Oakville? I didn’t, but I recently found out all about it first hand when I visited the Solana Salt Cave. 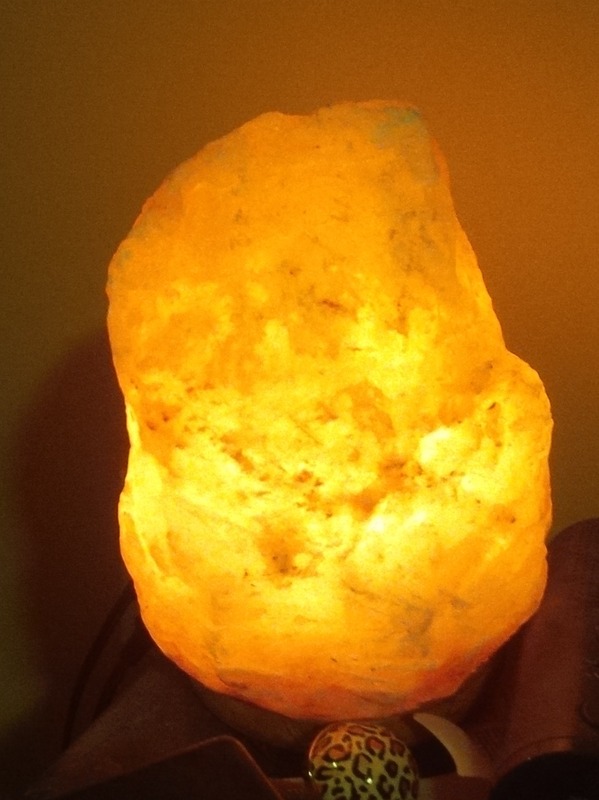 I bought a salt lamp for my room after seeing one at Chris’ house and doing some research about the benefits of salt therapy. Salt is a natural ion generator. 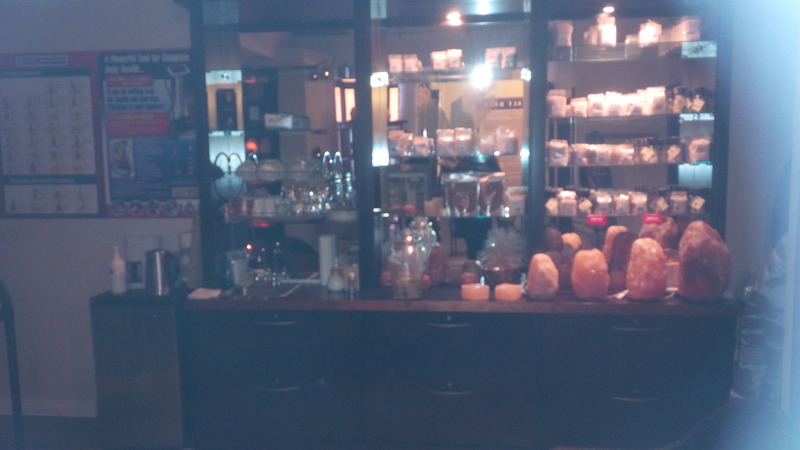 Salt lamps heat and release negative ions into the atmosphere. This works to neutralize air quality. Televisions, cell phones, microwaves, lighting, computers heating and air conditioning are just some of the elements in our households that may be gunking up our air with positive ions. Salt lamps can help neutralize this in your personal space. I keep mine on my night table beside my bed. Some naysayers think that holistic approaches like salt lamps are totally bogus. After spotting a salt lamp at my doctor’s office once, I asked her if they are legit. “Let’s put it this way…” she said, “They definitely don’t hurt, and they probably help. So why not keep them in your space?” Sounds good! Himalayan salt is said to help with allergies, stress, migraines, fatigue, insomnia, nervousness, and lack of concentration or focus. As I’ve mentioned before, I have suffered with chronic allergies. I have experienced a great deal of relief in the last few months; some of it may be attributed to my lamp! And I really love the calming warm glow that it brings to my room. I also really love having Epsom salt baths to help with muscle soreness and neck pain. My fave: Life Brand Eucalyptus Epsom Salts. I throw them in a hot bath, slap on a mask and I’ve got a decadent at home spa experience. Since I have had such great experiences utilizing salt holistically, I was really excited to hear about the Solana Salt Cave. So, what the heck is a salt cave? The floor, the walls, and the ceiling of the Solana salt cave are covered with food grade fine crystal salt. Tons of large salt rocks surround the visitors placed along the walls and also displayed in wooden crates. This salt is dry and clean. 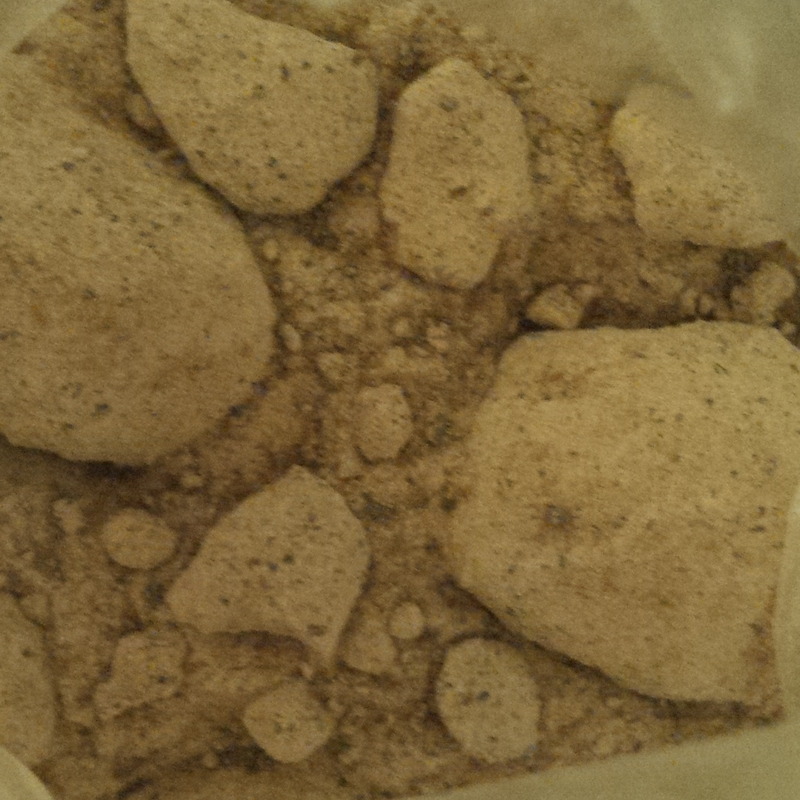 To ensure the purest quality, the cave contains Himalayan pink crystal salt. The size of the room is 450 sq. feet which allows 8+ persons to comfortably be seated during the Halotherapy sessions. The salt cave itself is a completely separate space, isolated from the rest of our store areas. The salt aerosol consists of salt particles in sizes of 1-5 micrometers. The particles carry kinetic energy which is succeeding immediately after crushing the salt crystals in the grinder. The salt concentration of the air in the treatment area is approximately 73.5 mg (0.0002592 oz) – similar to the consistency of salty air at the beach on an average morning. But the salt consistency can be adjusted: in case of different diseases, various cure modes can be implemented. The salt cave prefigures a dry, sterile and hermetic space. The large amount of dry rock salt creates a special microclimate which is identical to the underground salt caves. Translation: the salt cave contains loads of salt that is extremely good for you. As the salt is inhaled while sitting it the room, it travels through the sinuses and respiratory tract absorbing moisture, cleansing, clearing mucus and killing bacteria. Salt caves are extremely popular in Europe but thanks to Solana , you don’t have to travel quite so far to reap the benefits. Sessions in the salt cave last for fifty minutes. A minimum of three sessions is recommended. 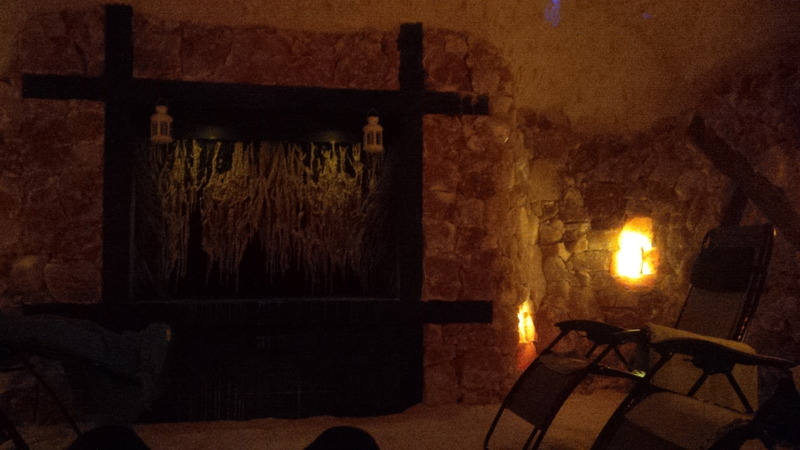 When I entered the salt cave on my first session, I felt immediately relaxed and comforted by the space. Literally every surface was made of or covered in salt. There is relaxing music playing softly and there is the quiet sound of rushing water from a water feature on one wall. There is space in the cave for 8 people to recline on loungers. Blankets are provided ( and needed as it was a bit chilly). You can wear regular clothing into the cave. I was given plastic covers for my shoes. It is extremely relaxing in the cave. I particularly liked the tiny twinkly lights that changed colours. I used the fifty minutes to literally just sit back and relax, and the time passed quickly. After my session in the cave I felt relaxed and restored. I recommend having a salt cave session at the beginning of the day , as I really felt centered and focused to take on the day afterwards. A 50 minute session in the Solana salt cave is $35.00. Packages are available and promotions are often offered. There is a weekly yoga class that takes place within the cave. 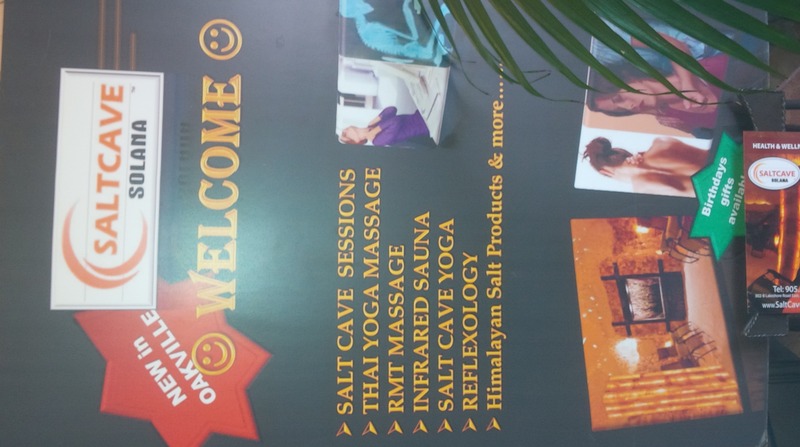 There is even the opportunity to have a massage done inside the salt cave as there is a registered massage therapist on site. I will absolutely be returning to take advantage of that amazing experience. For a full price list, check out http://saltcaveoakville.com/prices/. There is an array of salt products available for purchase at Solana. I bought some bath salts and Himalayan black salt for food. I had never heard of black salt before, but apparently it is used in Indian cooking. It has the distinct smell of a hardboiled egg due to its high sulfur content. I was a bit unsure about this stinky egg salt at first, but it is said to have great benefits. Sulfur aids in the structural strength of hair, skin, gums, and joints, and in the processes of cellular repair and regeneration. It enables “sulfation” – a critical detoxification pathway in the liver and tissues, necessary for the survival of our cells and organs. Sulfur compounds help reduce the harmful effects of toxic heavy metals and other chemicals. Most importantly though- this salt is delish!! I am especially enjoying it on raw veggies. 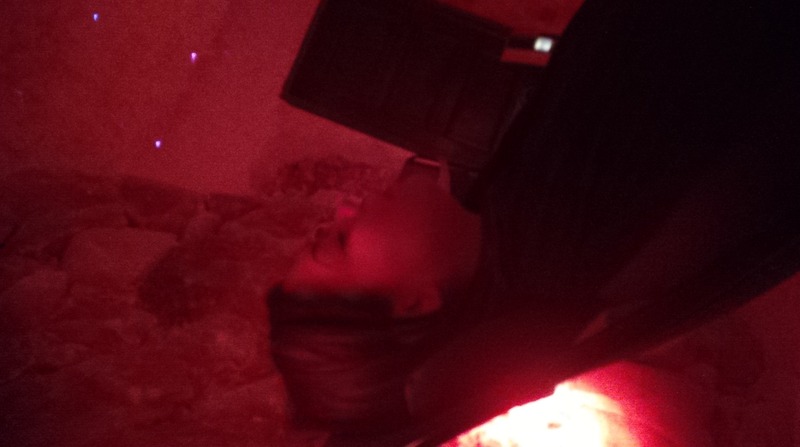 I thoroughly loved my experience at the Solana salt cave. My time in the cave was oh-so zen and I love the high quality salts that I picked up for home. I would highly recommend paying this Oakville gem a visit. 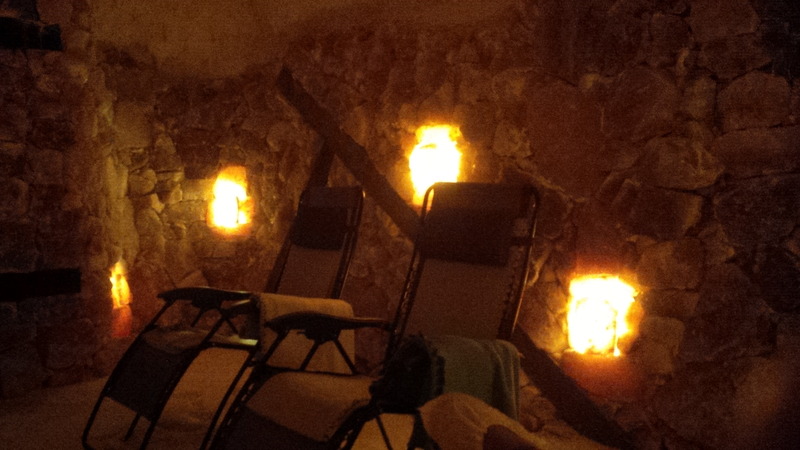 Solana Salt Cave is located at 302 Lakeshore Road East (905) 338-5555. It was Erica, I’ll definitely be returning! I love the lamp – especially with the green bulb! I must get one for upstairs….. And also visit Solana Salt Cave. Tres cool. Thanks for sharing. I should have mentioned that in the post. You had the great idea to use a coloured bulb in your lamp! You find the neatest places! I love Himalayan pink salt – I would love to visit this place.